You are not in the wrong if your bad need drives you to seek to borrow money at interest; the guilty party is the one lending money at interest. You can add Quranic verses that contain glorification of the Lord, such as 112:1-4, 6:18, and 2:255. Question: … What is your own opinion about those who infringe copyrights by turning books and any writings into PDF versions for free? … I sometimes need many references for my studies, and I cannot afford to buy them, and sometimes they are out of print … and I use and download those free PDFs available online via the internet … Some people claim that knowledge should be free … Is that prohibited stealing? Actually, we write a main title and a subtitle for most of our articles, and then headings and subheadings if possible, as these are the basics of writing of articles and research papers. Basic books and articles of the entire archive of ours are found on links in one page within the Arabic interface of the website, so that beginners and novices read first what will enable them to understand more recent writings. Your suggestion is a very good one; yet, we personally have no extra time and effort to implement it. We would like some of our fellow diligent Quranists to write such summaries if they can within comments under the articles and books if possible. God is the Omniscient Lord Who knows the future. No human being, dead or alive, can predict the future accurately or 100%. Therefore, horoscope writings are mere guessing and surmise that might or might not come true. Reading them for fun is OK, but do not allow such nonsensical items control your life or decisions. Repentance in general means to correct one's faith/belief and one's deeds, along with acknowledging one's sins and guilt to God, and then to make amends and atonement, and finally to be determined willfully not to return to committing the same sin. If this type of repentance is sincere and true for the rest of the believer's lifetime, God will accept it and He will turn penalty of these sins into rewards on the Day of Resurrection. To apply this in the case of the man you ask about, he must return the ill-gotten money to its rightful owners first, or to give up all of it if it is public money, and to be determined to start afresh, putting his faith on God and relying on Him. the Lord will then help him to earn his living through legal means, because those who are pious are certainly helped by God in many ways. Question: … Dear Dr. Mansour, … I wanna be a researcher like you, with original ideas as a Muslim Quranist thinker and writer who can deduce them from the Quran directly the way you do … Can you tell me the list of books that I must study on Arabic language and the Quranic language? … Thank you. Our Quranism website is a great A-level school of thought that contains all books necessary to enable a promising Quranist researcher to study and empower him/her with required research methodology and tools. If you spend months to read and reread the website archive of ours and all articles and comments of our fellow Quranists, you will certainly learn a lot to kick-start your career as a Quranist researcher; you will get to know history research methodology and tools to enable you to extract gems of the Quranic text, with its numerical miracles, Quranic stories, faith tenets, sharia laws, and higher values. Reading our archive will make you learn the Arabic tongue and the Quranic tongue as well as history of the Muhammadans and their earthly, man-made, fabricated religions and how they contradict the Quran (the only source of Islam). By the way, there is no certain book in itself that will make a researcher of you; rather, researchers must be active, excellent readers with awareness and critical thinking within extensive readings required from them to do. You are lucky to have time and effort to spend on reading the entire archive of our website. Your question is posed a lot to us and we have answered it a lot using the same reply. Believe us, our son, that we ourselves are not joking or jesting and that we are talking in earnest. It is inherent in the advantages of freedom of thought granted to you by Our Creator that the options of believing or disbelieving in God are both available as per your own free will and free choice. God created human beings to test them, and on the Day of Judgment, He will judge you as per your choices. This is a fact that we are to deal with it in earnest and seriously. One day, the day of your natural death, you will certainly know this truth based on first-hand experience in the moment of dying. We implore the Almighty to guide you and to guide us to the Truth. Please read as many writings as possible in our archive of books and articles; peruse them within a critical reading, and then choose for yourself. For us, you seem to believe wholeheartedly in God the Great Creator who created you and the great universe around us, from the atom to the galaxies. This good seed inside you is a good start; read our archive of Quranist studies, and then, you will read the Quran in a new way never felt or used before by you. Among your discoveries if you take our advice will be the undeniable fact that the Quranic text can never be authored by an Arabian man in the 7th century A.D.; the Quranic text combined depth and simplicity as well as eloquence and directness of style at the same time. Your problem apparently is the same one of all Muhammadans; it is that they wrongly think that the Sunnite, Sufi, and Shiite religions are part of, or representing, God's religion. Nothing could be further from the truth; these earthly, man-made religions have nothing to do with Islam (submission to God alone as God's only religion). Likewise, atheist wrongly think that other earthly, man-made religions are God's (e.g., Catholicism, Protestantism, Orthodoxy, Buddhism, Baha'ism, etc.). Each of the followers of each of these earthly, fabricated, man-made religions assume that their creed or doctrine is God's true religion, while these religions are opium of the masses. If you read the Quran without resorting to or relying on terminology adopted and explained in books of traditions and taught in corrupt educational systems in the Arab world, but read it in its own terminology as explained on our Quranism website and our theory/school of thought of Quranism, you will realize that the Quran is God's true religion which is a mercy for the humankind, with its higher values of justice, fairness, charity, peace, freedom, human dignity, etc. We beg you not to get depressed or to fall into the abyss of despair; please read our entire archive of Quranist books and articles. We implore Almighty God to guide you and to guide us. In fact, we decided at first to ignore your email message, and we felt it does not deserve a response; yet, we felt that your confusion and your hesitant stance is shared by so many. Similar email messages of the same content have been sent to us. This is why we will reply here below, hopefully for the last time, to such type of letters from those hesitant to follow the Quranic Truth and need endorsement of anyone. We have written the following over and over: the Muhammadans are in dire need of peaceful religious reform from within Islam (i.e., the Quran alone) and peaceful reform on all the other levels, especially the cultural one. This is not going to be realized by Wahabi clergymen who are power-hungry and seek nothing but to hoard and accumulate wealth. Quranism is an intellectual trend spreading via the internet to correct faith and belief tenets of the Muhammadans using the Quran as a criterion. Quranists seek no money or any type of transient possessions or rewards from anyone and seek no positions, posts, stature, political ambition, etc. The only aim of all Quranists is to please God by exerting our utmost efforts within our intellectual jihad within the internet to preach true Islam to reform Arabs and to raise awareness of all people, especially in the West, that real Islam (i.e., Quranism) has nothing to do with terrorism, extremism, fanaticism, bigotry, and backwardness. These items are linked closely with earthly, man-made, fabricated religions of Sunnites, Wahabis, and Shiites. Quranism is not confined to us, Dr. A. S. Mansour, but our intellectual trend include hundreds of Quranists who are researchers and preachers; we are personally only one of them; we declare here that we adhere to the fact that we are only a student before the only imam in our life: the Quran: God's Word. We are still learning every day from it; we deduce new notions until now from the Quranic verses. The Quran still has many gems and treasures to be discovered and elucidated. Of course, we express in our writings our own points of view and leave a space for everyone to comment on what we write. This is one of the major differences between us and those professional traders or filthily rich preachers who manipulate the Quran by trading away God's revelations for a cheap price (i.e., worldly transient possessions, power, wealth, etc. ), so they barred others from God's path. It is absurd that such sheikhs and clergymen consider their views to be irrefutable absolute truth and representative of Islam and not ascribing their view to their minds as Quranists do. They adamantly refuse any discussion of their views, despite their being ignoramuses; indeed, they know very little about traditions and ancient books and tomes they defend and to which they claim to adhere. Such people repeat a certain set of phrases over and over for centuries; they are mere preachers who never tell the Truth. They either seek wealth and/or power or defend the rulers to gain benefits. Hence, we assert here that such corrupt people do not believe in the Quran or in the Hereafter; thus, they and their supporters never agree with Quranists and likewise, Quranists never agree with such people and their likes. Question: … It is rumored that Al-Azhar will launch a satellite channel to spread 'moderate' Islam … Yet, still some Azharite scholars deem TV sets and acting and arts as prohibited in their Sunnite Wahabi religion … For sure, the more religious channels that are launched, the more fanatics and extremists we have in Egypt … Those ignoramuses deceive viewers by presenting Sunnite Wahabism as though it were Islam. If it had not been for your Quranism website, things would have worsened in Egypt … I know you wish to launch a reformist, Quranist channel … How do you think Egyptian TV channels can be improved? If you are the minister of information, what would you do? Thank you for your email message; we wish we could one day launch a satellite channel to reform the Muhammadans using the Quran. May God help us realize this dream one day. As for your question, we have answered in an article published in (the independent Cairene) Al-Ahrar newspaper on 19th of April, 1993, titled "" TV for the Poor"; here is an excerpt of it: (… If Prophet Muhammad were alive today, he would surely use TV channels in preaching Islam. We say to those extremists who claim that owning and watching TV sets is prohibited that their view is faulty by all means: tools are neutral things and items; what is prohibited or not is their usage for evil or good purpose. A knife is a tool in the kitchen for cooking, but it can also be used as a weapon to kill; no one would dare prohibit owning a knife, we suppose! The usage of any item is what matters … TV programs can be used for enlightenment or for destruction … Programs of religious material have increased recently, leading to more sectarian violence and the emergence of more extremists and fanatics … on purpose, of course, as Wahabis control media … most literate people do not read and receive religious notions from such destructive programs aired on public TV channels … No real awareness is ever coming from such channels … The image of Islam is being tarnished by ignoramuses appearing on air daily … they are using corrupt notions unrelated to Islam and causing more backwardness and insulting the Quranic teachings … Islam is God's religion for all eras and not a bygone stage of the Middle Ages … Scientific miracles hinted in Quranic verses can be used for preaching and urging the youth to learn and discover … The Discovery Channel in the USA is the best example; we can create a similar channel to make people see wonderful miracles of nature … This increases belief in God the Creator and urge the religious youth to be scientific … Let Egyptian State TV buy copyrights to some movies from Discovery Channel and to air them without editing … and then add interviews with Egyptian and Arab scientists in Arabic about miraculous hints in Quranic verses … this will serve Islam and serve the future of Egypt instead of sectarian strife and spending time discussing religious traditions that are of no use at all …). We have said before that he was an inveterate liar who denied the Quran; those who deny any Quranic verse is denying the whole Quranic message and denying the fact that God preserves His Quran. This Wahabi view is contradicting Islam; within real Islam (the Quran), each peaceful person is a Muslim regardless of their faith and denomination or lack of faith of any type. God is the only one to judge human beings' faiths and acts of worship as sincere, acceptable, polytheistic, or hypocritical etc. on the Day of judgment. Islamic sharia in the Quran has no worldly penalties (i.e., exacted by humans on other humans) at all regarding drinking wine, laxity in performance of prayers, and apostasy or rejection of Islam. Read on our website more if you have questions of similar nature, in order to save our time. Based on the Quran, we tend to believe that there is no life at all in other planets or galaxies. Yet, there is life within the Barsakh levels, overlapping with the earth and the heavens, filled with devils, Jinn, and angels, and we cannot see them of course. Hints of what we refer to here are found in these Quranic verses: "And of His signs are the creation of the heavens and the earth, and the creatures He has spread throughout them; and He is Able to gather them at will." (42:29); "To God bows down everything in the heavens and everything on earth-every living creature, and the angels, and without being proud." (16:49); "But if they are too proud-those in the presence of your Lord praise Him night and day, and without ever tiring." (41:38). Devotion is of two types: in faith/belief and in acts of worship, and both are under the notion of devotion in religion. We refer you to the first verses of the Quranic Chapter 39; devotion in acts of worship is to dedicate them to God alone without any mediators, saints, mortals, etc. of any type, and without glorifying any prophet or angel of God at all. Moreover, a worshipper should never be hypocrite who brag and show off their worship acts before the eyes of others. Devout ones dedicate their deeds to God and imploring Him to accept their deeds. In addition, real devout ones who dedicate their life to God in piety remember God if they are about to commit a sin, and they refrain before committing it, bearing in mind that God is Omniscient. Your heart should be cleansed from any sanctification toward any mortals (prophets and non-prophets), as sanctification should be entirely for God. one should not care to gratify people with good deeds; rather, to please and gratify God alone. This is a myth that allows ample room for ascribing lies and falsehoods to Muhammad. It was a ploy employed within the Sufi religion to deceive gullible people. Dreams do not count in Islam and have nothing to do with one's faith or even lack of it; all people see different dreams as per what influences their minds. Sometimes, those who believe in dreams and interpretation of them would commit polytheistic acts that are against Islam. We have answered one of your email messages before, telling you that we cannot help you in that respect, but you insist on chasing us. Why do not you contact WWE via the internet yourself?! We do not know anything about any type of sports and know no one inside the USA to help you. We have no time and no means for such services. Please stop sending your strange request to us over and over; we cannot do anything to you. We welcome you as a new visitor on our website. Please read our book titled "The Quran Is Enough", and you will find a detailed answer to your question. The Quranic term ''messenger'' has many meanings in the Quranic text; one of them is the Quran itself. The Quranic command about obeying the messenger refers to the message itself (the Quran) after the death of Muhammad. Hence, the Quran remains until the end of days to be the messenger of God to all humanity. To obey Muhammad is to obey the divine message and revelation conveyed by him as he received it from God. hence, this term ''messenger does not refer to any other person, or else, people might think there is another messenger or prophet to come, and this contradicts the Quranic fact that Muhammad is the Seal of Prophets and the last on of God's prophets. Hence, there is no divine revelation after the Quran and the only messenger we have after Muhammad's death is the Quran itself. Please read the Quran while asking and imploring God to grant you guidance, NOT to search for anything supporting your biased view or your prejudice. May God guide you and us to the Truth. 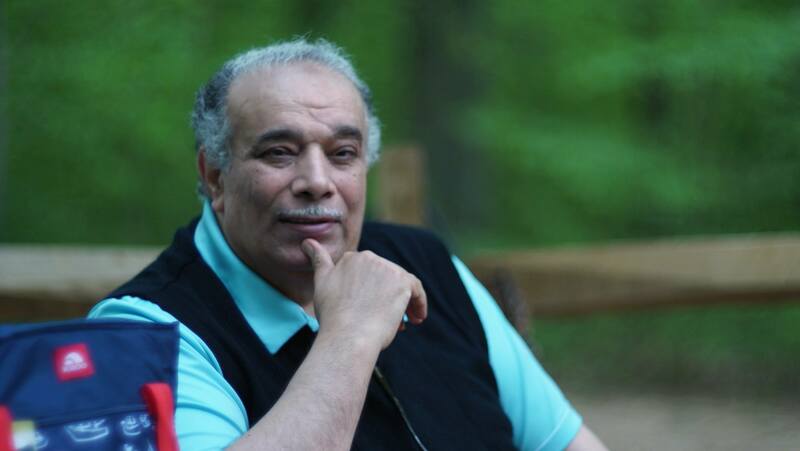 Question: … Ahmed Subhy Mansour [you are] a pig-headed fool! … The mention of his very name fills me with utter disgust! … An infidel like you dares to criticize and insult the saintly imams and founding fathers who delivered to all generations correct faith centuries ago! This apostate will be killed one day or suffer a terrible death! … Islam will never be defeated by the likes of you! You are a pagan idol to your followers! You dare to claim to be a prophet of God! my pen is ready to refute your ideas and expose you in cyberspace! … May the devil receive your soul soon enough! We never claimed such a thing as you dare to lie about us. It is you who worship mortals as deities. This is polytheism. All of us will meet on the Day of Judgment and defend our stances; "…"Act according to your ability; and so will we.And wait; we too are waiting."" (11:121-122). Of course, mosques are God's houses and they should be made to receive all peaceful persons regardless of genders and faiths/beliefs.